I know what you’re thinking. 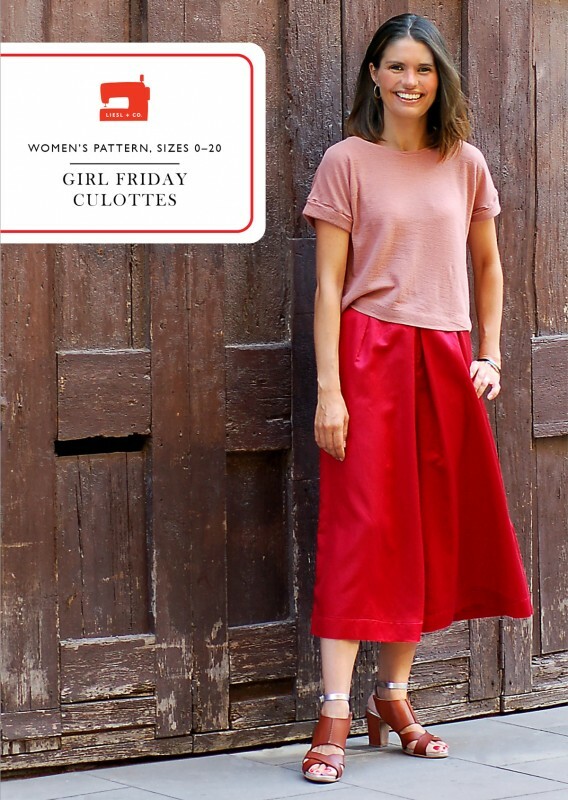 You just read the word “culottes,” and if you’re about my age or older you’re getting ready to run away as fast as you can. But this is not the culottes of your youth. Or your mother’s youth, if you’re younger than I am. Stick with me for a minute while I introduce you to our new Girl Friday Culottes pattern. I think you’ll be glad you did. See what I mean? These culottes are more like a full skirt. And a very elegant full skirt, at that. And they’re surprisingly versatile. They’ve actually become a staple in my wardrobe, crazy as that may sound. 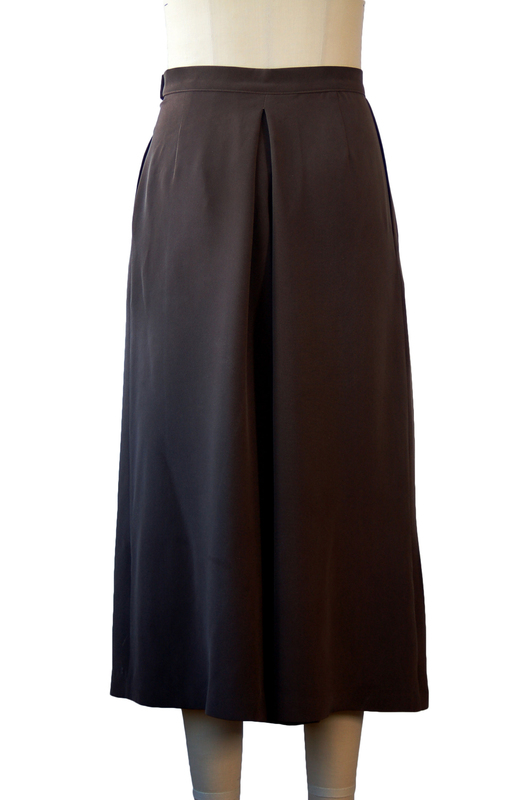 They have hidden side pockets (not your typical on-seam pockets–much cooler than that), a very hidden (and surprisingly easy-to-sew) zipper inside the left pocket, pleats that hide the rise and make the culottes look more like a skirt, and flattering back darts to give you a smooth look from behind. 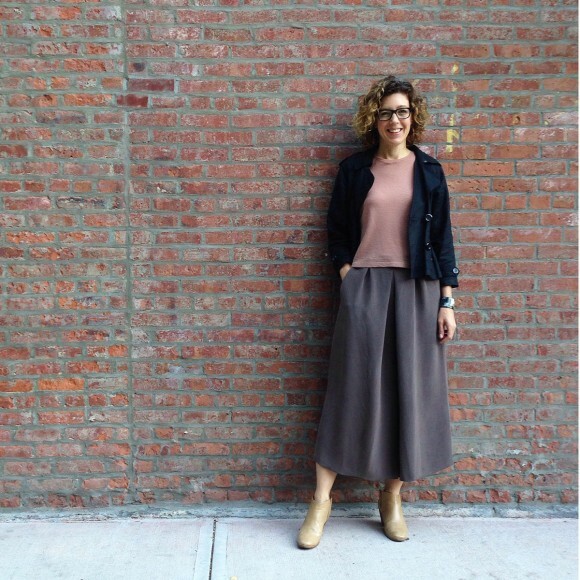 And by the way, did you know that culottes are surprisingly flattering to your back end? It’s true! If you’re a classic sort of girl, you can wear these in a New Look sort of way. You know what I mean when I say New Look, right? 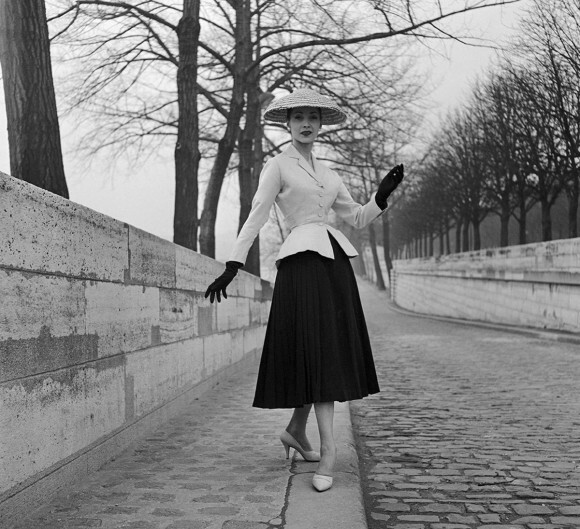 Christian Dior, 1947? Here’s the iconic image to spark your visual memory. You’ve seen this photo before, right? Obviously the Girl Friday Culottes aren’t the New Look, but they can be worn in that same narrow waist, full-skirt, classic/vintage sort of manner. (Some of Dior’s dress designs even had a culottes feel.) Tuck in your blouse or T-shirt and slip on some pumps and you have a timeless, feminine look. The fact that they’re culottes just adds to the appeal here. You can ride your bike (really), run after the school bus (like we did yesterday when it arrived ten minutes early), or dance (see the influence of that inspiration I mentioned?) and still look feminine and stunning. Classic heels and red lips? Done. Or you can give the culottes a more contemporary look with a boxy top like the one I’m wearing in the photo above (Interested in sewing your own? Stay tuned.) or even a long, oversized tunic or sweater if you’re daring and want to channel that It Girl look. This look is more about emphasizing a lot of volume and will take a little more confidence than the classic look I described above. It’s much more fashion-week ready. Personally, I just like that they’re so versatile and truly wearable. Still not convinced? As I was working on this pattern I collected a ridiculous number of tear sheets and images to show you. 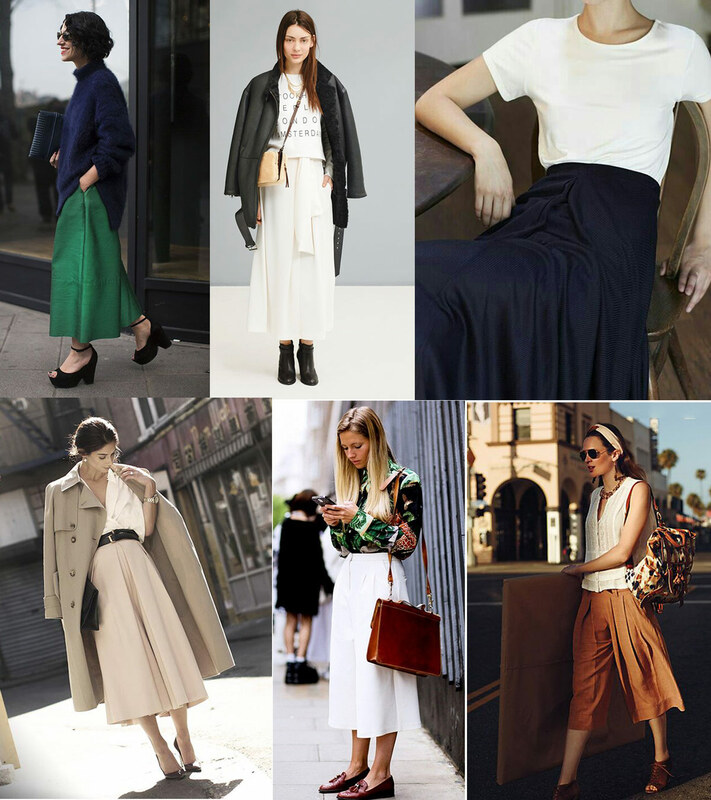 Culottes are everywhere right now. Here are some images with more classic styling to inspire you. And here are a bunch of images with contemporary styling. You can see many, many more examples, including lots of images with contemporary styling, in my Liesl + Co Styling Ideas Pinterest board. But now do you see what I mean? 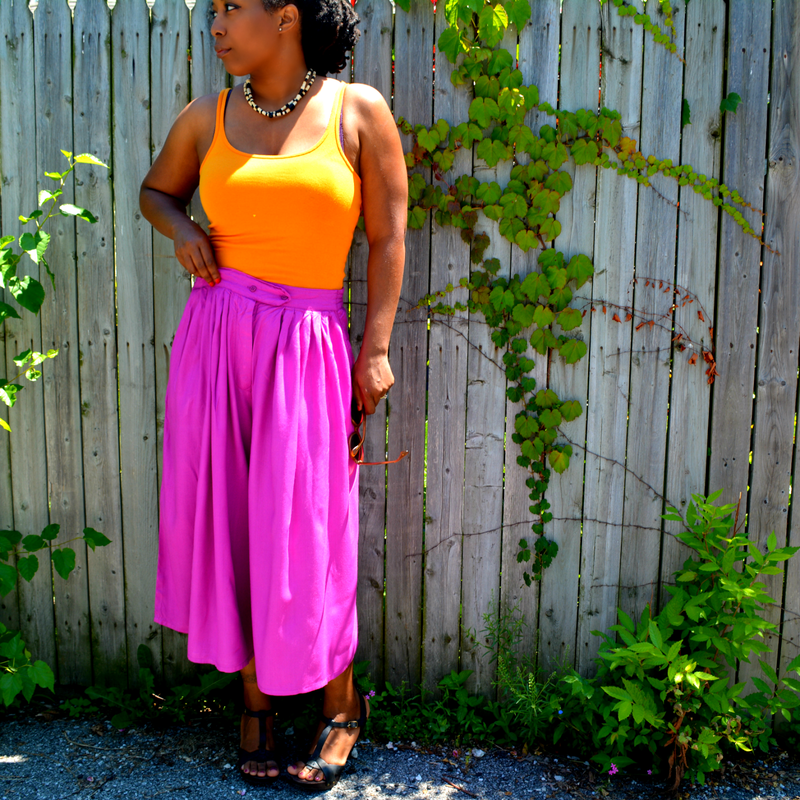 I’ve been wearing these culottes in linen all summer and have gotten so many compliments, particularly from my New York friends who are much cooler than I am and who have sort of freaked out over this style. What else? Oh yes, this pattern goes up to size 20 as well! All our new patterns are sizes 0-20. I posted a couple of previews of this pattern on Instagram last spring and they got a very positive response. The black linen version in my Instagram photos was made from handkerchief linen I got at Gray Lines Linen, and the clay-colored version in the photos below is made from heavyweight washed silk I found at Mood. Here is the side view. I like how the skirt gently flares. 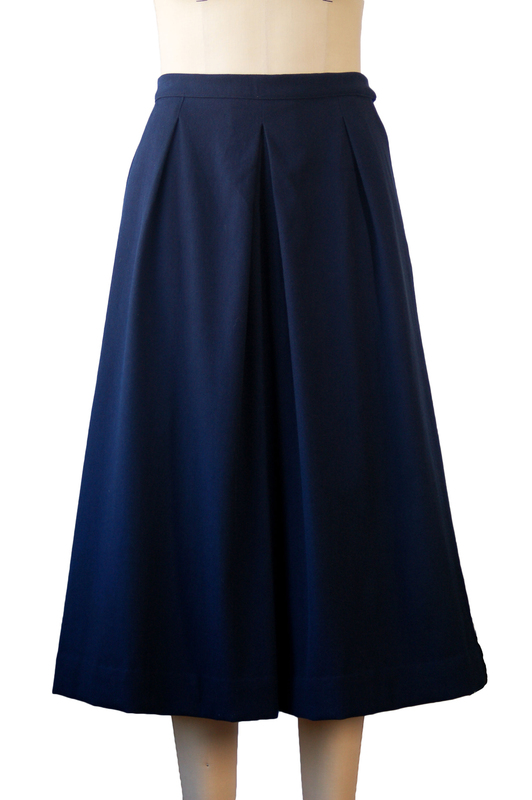 You can also use a heavier fabric for a fuller-looking skirt. This navy pair is made from a heavy cotton/wool blend (also from Mood) and will be fantastic for cold weather. These might even be warm enough to wear on New York’s coldest days. 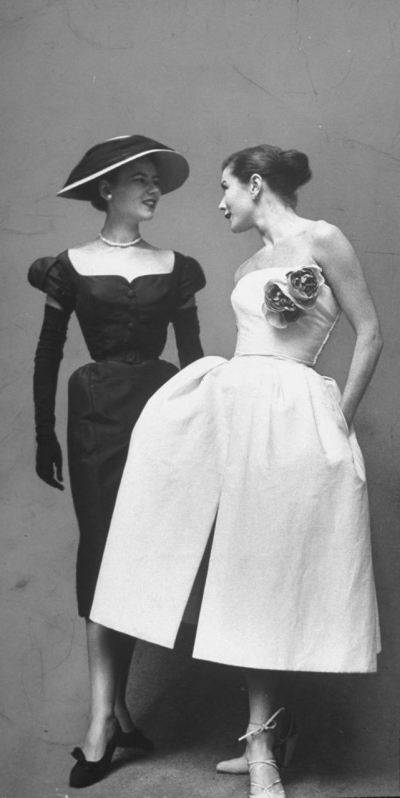 I still really want to make a pair from a silk faille for a really dressy look, too. Wouldn’t they be great in navy or a pale pink? And they could be worn with a casual T-shirt for everyday, so you don’t need to save them for fancy occasions. So there you have it. I really wasn’t kidding when I said culottes! You can see all the information about them here. I can’t wait to see what you do with yours. Thank you, Liesl, for this great pattern! I used to wear a lot of culotte when I was a girl and I have always liked them. In fact, I still have culottes in my wardrobe, but they don’t fit me since my last pregnancy. So this is fantastic, I will have new culottes perfectly fitted, thanks to you! I would love to see these on someone short and curvy. I think I am not tall and willowy enough to pull off this look, unfortunately. Maybe you could send your new patterns to the Curvy Sewing Collective to have them try them out on curvy figures? Ohhh! I really like these! I have culottes that I wear often but they aren’t nearly as cute as these. I especially like that they have pockets. I cannot wait to make these! Gosh, I remember culottes. I remember wearing them when I was young and loving them! Then they went out of style and you couldn’t wear them without feel judged! These look absolutely scrumptious and it’s hard to tell they are culottes. Thanks so much for creating this beautiful pattern! I love these. add a bit of length and I can even use them as a riding skirt for when I ride my horses! What a beautiful pattern! Please tell us this will be released in children’s sizing too this season?! love it so much I just bought it, but I have had 2 download failures ( I have downloaded patterns in the past, no problems). My file only contains a blank gray screen. Nevermind! lol! I opened it up from my saved file and there it all was, nice and clear. Just had to do it a bit different than usual. Can’t wait to make them, will be great for here at home as well as out and about. Love it! For those of us who really need some elastic in a waistband for comfort, do you think we could make the waist a tad bigger, and use elastic to bring it in? Hope that makes sense. Love the striped top the model in the Kona Cotton Culottes is wearing. Seconding the request above, the opposite of the usual “can I get it in my size” — can I get it in kid sizes? I did want to run away when I read culottes but I’m glad I read this post. Looking forward to seeing them on someone my size/height so I can decide if they work for me or not. These certainly look bike friendly! And PLEASE tell me the boxy top hint is the striped one the model is wearing with the cotton culottes. They are so very extremely fashion forward. 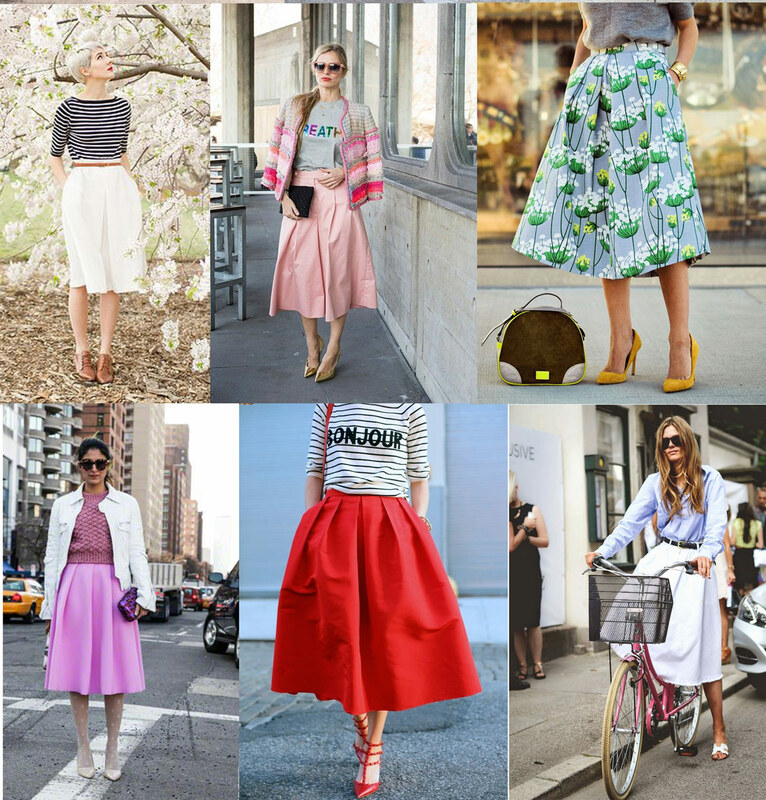 If you look up culottes on Pinterest, there are hundreds of chic ways to wear them. I think trying a few pairs on in stores first might be really useful for getting an idea of how to wear them and what fabrics you like. Thank you thank you for showing the pattern in different linked fabrics, that is the hardest part for me. 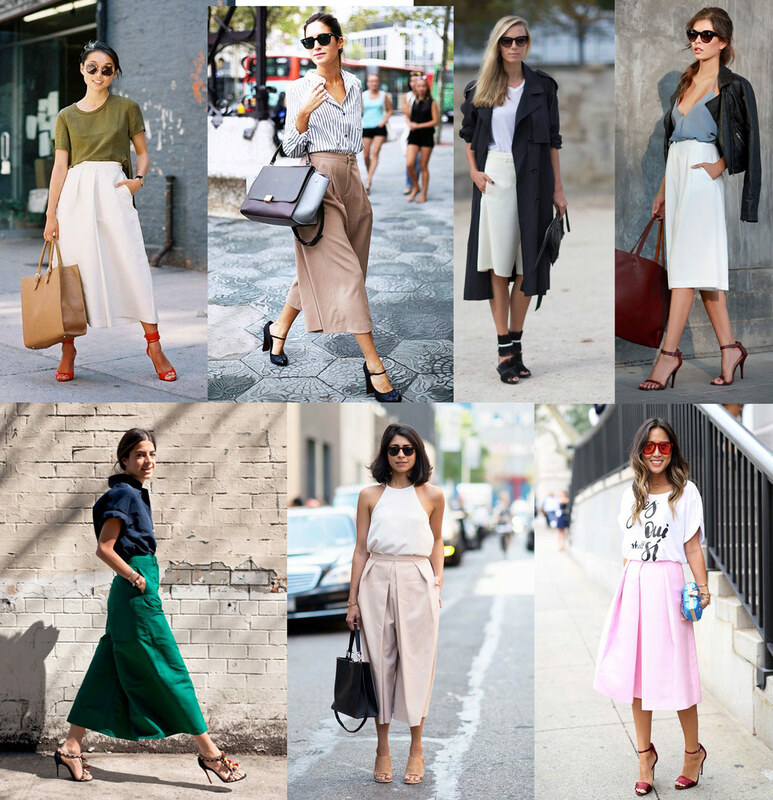 Love the culottes. Loving these!!! Can’t wait to make them. I spied a pair in your contemporary gallery that look like they are made out of a very soft (rayon?) knit, going to try them in that…imagine how swishy they would be? Sigh…. 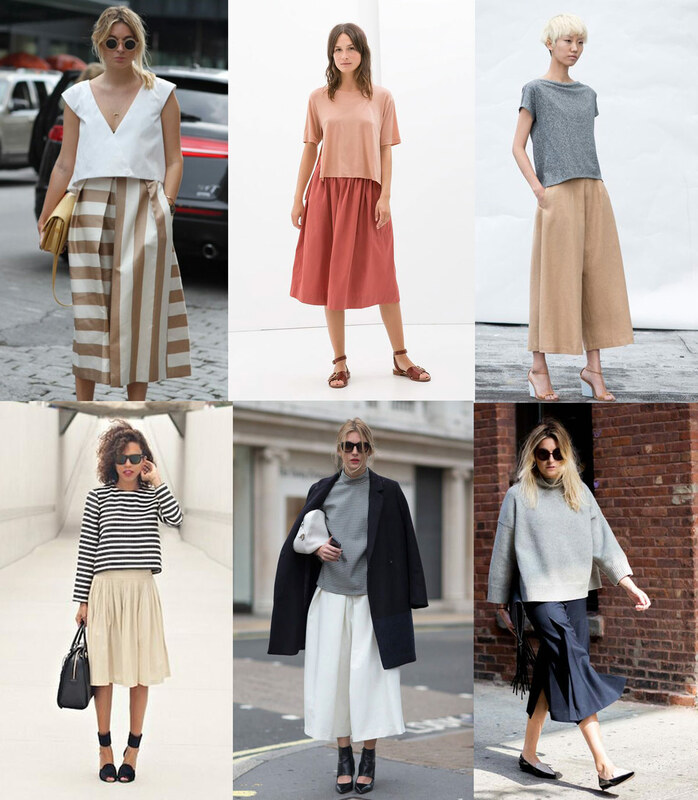 I have not been that enthused with the return of the culotte, but I read through your post and this may be my turning point! I appreciate all the styling images (I am loving that board on your Pinterest feed) and now I’ve been kind of obsessing the last two days. It looks like I “need” this pattern now. This looks like a beautiful pattern but it looks like you have to be really tall and skinny to pull it of. I would love to make these but being only 5’1 and the fact that I never wear heels probably means that I would look ridiculous in them. Its a shame but I cant wait to see what others make. I had the same response to the word ‘culottes’ BUT I absolutely love these! Wow. And I’m really liking that little boxy top, particularly the stripe version. Is this a forthcoming pattern too? Ooh, and I love these in bright pops of color! I am intrigued by these culottes (now there’s a sentence I never thought I’d write). Is it possible to see a video of someone wearing them to see how they move? 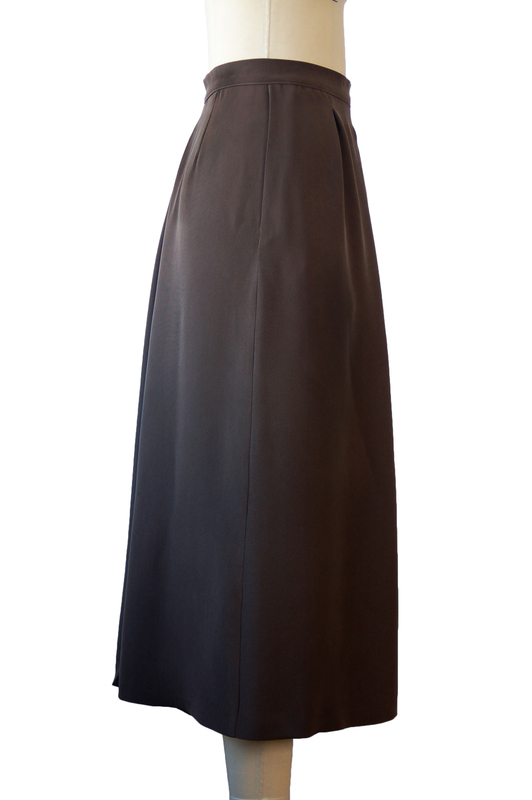 These are really interesting, wore some shop bought short cullotes all summer, great for playing with the kids and keeping one’s modesty… wondering if they would work floor length as a maxi cullote? Hi Jessica! This is the same pattern I was wearing, but you might be also remembering another skirt that I wore the same weekend. That’s an upcoming pattern. I hope you’re well! Thanks for the lovely note you sent. I love the pink skirt, the lady is wearing a t-shirt with BREATH on it. I was looking for that for a very long time. But where do I find the pattern please ? Hope to hear from you soon.